An exclusive personalised ladies apron with red gingham check. A thoughtful Christmas gift for a mum, sister or special friend! Our personalised aprons are custom made with a professionally embroidered applique in the letter of your choice. The applique is created in red festive gingham check. Our hardwearing aprons are machine washable and a premium quality. 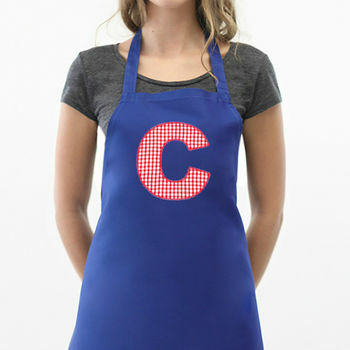 With a choice of three colours for the apron (hot pink, red or navy blue), which will you choose for the perfect gift?